I’ve already stated the 70s was a period of transition with my music listening habits. Covered here as it pertained to an influential work that got me into Jazz Fusion, John Klemmer’s song and album, Touch, proved to be one gateway into this crossover jazz genre. Yet, another piece of vinyl was what ultimately hooked me. Recorded by an Los Angeles native nowhere near home. Taking a much different city to heart, as channeled by composer-arranger, west coast jazz/jazz fusionist, and saxophonist, Tom Scott. His New York Connection album was one of the first in that music category I ever owned, and later prized (I recently re-bought the LP). You may not recognize this artist’s name, but I reckon you’ve likely heard his work and didn’t realize it. Appreciate Carole King and her song Jazzman (which I spotlighted last summer)? Well, that’s Tom Scott performing its stirring sax riff. Ever seen Starsky & Hutch, The Streets of San Francisco, or Family Ties on TV? Their theme songs were written and arranged by the same guy. The old tomcat has, in fact, sat in and played on records for the Grateful Dead, Kenny Chesney, The Carpenters, Whitney Houston, Barbara Streisand, Joni Mitchell, Blondie, Eddie Money, Steely Dan, Pink Floyd, Quincy Jones and even the Chairman of the Board, Frank Sinatra. On top of that, he’s performed with each of The Lads during their solo careers. Studio recording sessions with Paul McCartney and George Harrison*, two LPs with Ringo, and stage band work with John Lennon. * George paid Tom back by performing slide guitar on this album’s Appolonia cut. Without realizing it, I’d come upon the artist, via this album specifically, on a change of pace for both us. 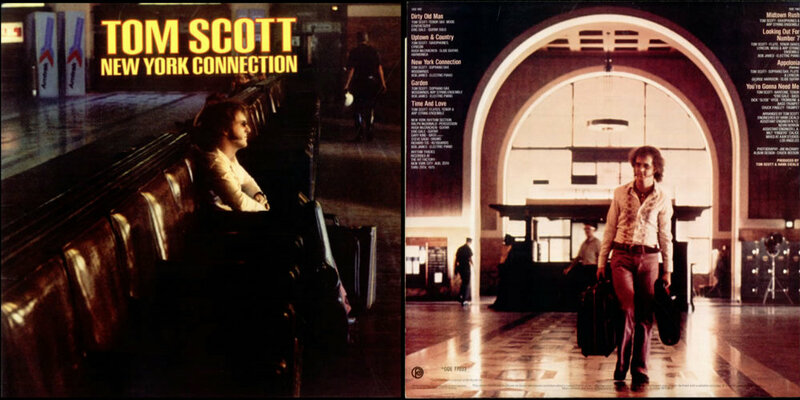 For Scott, experimenting away from the more rock/funk style of his earlier L.A. Express days (a group, as it happens, that helped define Jazz Fusion) and toward a more melodic, evenly tempo’d approach. Like his older Jazz forbears. Here he’d record with some superb New York session musicians I’d come to know quite well later. 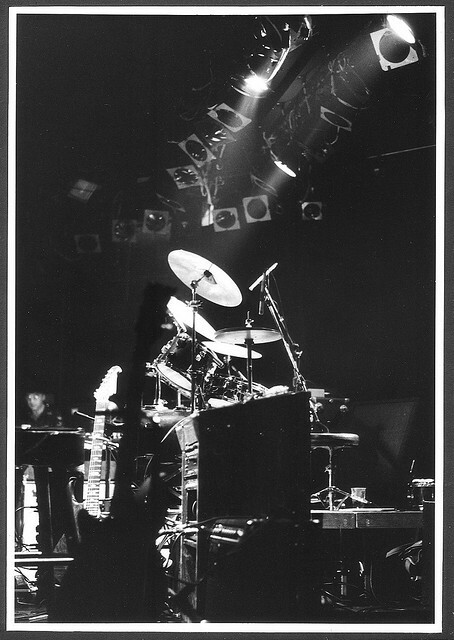 The likes of Bob James, Eric Gale, Ralph MacDonald, and Steve Gadd to name a few. The album would be quite different than Tom Scott’s ‘L.A.’ work. New York Connection being a moodier, mellower collection of tracks, but one that still represented the best of this musical hybrid. Benefitted from dynamic talent joining together, also. I can bring the tone-arm down on this album and be drawn right back to a period when it was “… all about the music“, as some remember. Whisked away from the current over-produced tunes and into a decidedly less formulaic era. You know, when hip-huggers and bell-bottoms were fresh, kinda, and nowhere near ‘retro’. Of all the LP’s tracks, there’s one that grabbed me and became a clear favorite, like it did with other Tom Scott fans. Emblematic of the music tide coming in that absorbed countless listening hours to come in the years ahead, Time and Love typified the new strains. Composed By Ralph MacDonald and William Salter, recorded toward the end of August 1975, the instrumental carried all the attributes already stated. During the 80s, it was at a Tom Scott gig at the Roxy Theatre on the Sunset Strip where one of those freaky events occurred in my life. Where my future bride and I crossed paths before we ever knew of each other, or started dating the one we’d each marry. Accompanied nicely by flute (an instrument by daughter now plays), the Arp String Ensemble synthesizer and Eric Gale’s steady guitar, its tenor saxophone by you-know-who made it a stand-out. The tune did compact a lot in its brisk four and a half minutes of runtime. Deceptively so. Time and Love built immediately upon an unhurried kick off with another stellar riff. Let’s call it foreplay, the start of Scott’s passage heralded the song’s awakening tempo and the escalating chords at the ready. I can only imagine what my 8th grade Music Appreciation teacher would think, but it reminded me of a classical piece of music and the famed progression she taught. Ravel’s Bolero. No kidding. Listen to each. Both featured cascading notes and rhythm that built to a crescendo. Each a barely contained release, as it were, by melody’s end. Hell, the song’s title hinted its intent back in ’75. This little gem of an album cut, with more notable reed-work by Mr. Scott, delivered on the musical amalgam brewing. Much like the jazzier parts already striking at this listener’s ears, and the 70s, back then.